Aceh (/ˈɑːtʃeɪ/) is a province of Indonesia at the northern end of Sumatra. Its capital and largest city is Banda Aceh. It is close to the Andaman and Nicobar Islands of India across the Andaman Sea. Aceh is a religiously conservative territory and the only Indonesian province practicing Sharia law officially. Islam first entered Indonesia here. Aceh has large amounts of oil and natural gas. Some estimate that Aceh gas reserves are one of the largest in the world. 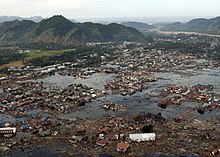 The west coast of Aceh, including the cities of Banda Aceh, Calang, and Meulaboh, were hit hard by the tsunami after the magnitude 9.2 Indian Ocean earthquake on 26 December 2004. More than 170,000 people were killed by tsunami in Aceh and about 500,000 were homeless. 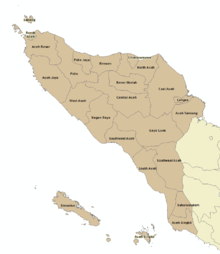 Aceh is governed not as an Indonesian province but as a special territory (daerah istimewa). This different title is to give the area more autonomy from the central government in Jakarta. The province is has eighteen regencies (kabupaten) and five cities (kota). The capital and the largest city is Banda Aceh. It on the coast near the northern tip of Sumatra. ↑ "Statistik Indonesia 2018". Badan Pusat Statistik. Retrieved 23 July 2018. ↑ For details of the impact of the tsunami in Aceh, see Jayasuriya, Sisira and Peter McCawley in collaboration with Bhanupong Nidhiprabha, Budy P. Resosudarmo and Dushni Weerakoon, The Asian Tsunami: Aid and Reconstruction after a Disaster, Cheltenham UK and Northampton MA USA: Edward Elgar and Asian Development Bank Institute, 2010. This page was last changed on 2 March 2019, at 07:31.